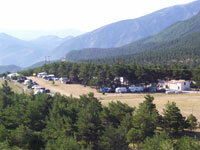 You will find below a list of campsites, guest houses and hotels. Do not hesitate to contact us if you do not find a suitable accommodation in this list. One room with king size bed, one room with two single beds, and two couches in the main room. Separated toilets and shower. Terrace with table and chairs. Fully equiped Kitchen. Rental par night off-season (45 Euros /night) in April, May, June and September. Rental per week in July and August. Situated at 27 km. from Castellane, on the road to the "Allos" pass (altitude:972 m.). Swimming pool, snack, mobil-homes rental. Meeting point for the ABOARD Rafting spring trips on the Upper Verdon. 1* campsite : "Camping des sirenes"
Restaurant "le Bistrot du Col", heated swimming pool, situated at 9 km. from Castellane, at "les Lecques pass" (altitude:1148 m.), mobil-homes rental. 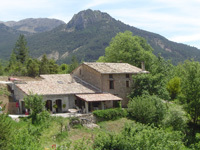 Restaurant "La Ferme", food store, washing machines, heated swimming pool, situated at 800 m. from town and 400 m. from the supermarket, mobil-homes rental. 4**** campsite: "Le Camp du Verdon"
Bar, restaurant, snack-bar, food store, washing machines, heated swimming pool, situated at 1000 m. from town, mobil-homes rental. 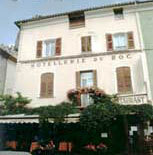 4 bedrooms & "tables d'hote"
Rooms for 3 to 5, dormitory for 16. At 25 km from Castellane, near St-André. Meals on request. 21 km away from Castellane, direction Moustiers. French pancakes with various honeys. 2** hotel and restaurant: "Hotel du Roc"
3*** hotel and restaurant: "Hotel des gorges du Verdon "
Panoramic terrace, swimming pool.Close to the Verdon gorges. Facilities for company meetings. 3*** hotel and restaurant : "Chateau de Trigance"
10 rooms (including 2 suites) in a middle-age setting. 4**** hotel and restaurant: "Chateau de Taulane"
Facilities for company meetings, golf course. Please contact these places directly if you wish to make your booking arrangements.